On New Year’s Eve, a baffled American TV audience watched a live performance by the superstar and ultra professional Mariah Carey go down in flames in the middle of Times Square, NY. It took just a few days for communications consultant Rick Altman to come up with an analysis on how the situation could have been avoided, in spite of difficulties with the technical production. This blog article is a part of the Crastina theme “using the art of public speaking to inform, inspire and instigate”. Rick Altman runs betterpresenting.com, a company which carries the slogan Making the world a better place, one presentation at a time. 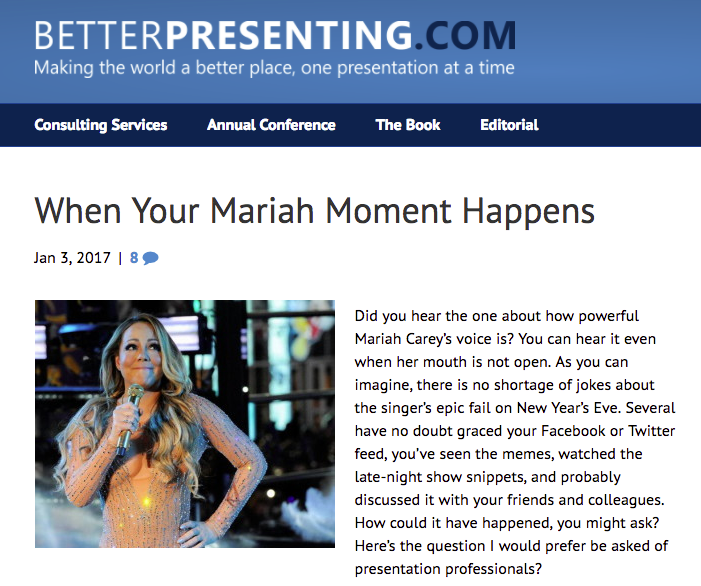 In a newsletter dated January 4, he took a lengthy look at all the gory details of Mariah Careys TV infamous appearance and suggested how a public speaker in a similar situation ought to deal with the situation. Hi Rick! How come Mariah Carey’s problems on stage during the New Year’s Eve broadcast from Times Square got so much attention in US media? This is not one of our more flattering qualities, and I’d be interested in knowing if citizens of other countries exhibit this same tendency. I refer to the compulsion to build up a rising star and tear down a megastar. We seem to take delight in this never-ending process and no industry is exempt from it. 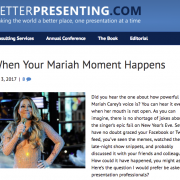 Because of the particular qualities I discuss in the article – Mariah Carey’s quest for on-stage perfection – her epic fail was particularly noteworthy. If you could freeze time and step up to her when she was encountering her problems, what piece of advice would you have given to her? What three things can early career scientists and engineers learn from studying videos of situations like this taking place in showbiz? It doesn’t matter what you are speaking about and it doesn’t matter how much practice you have had speaking about it. Audiences want to know that you care deeply. Audiences will forgive a multitude of presentation sins if they feel that you are passionate about the subject they have come to hear.